It’s a recognition that is not just a first for the University of Nebraska at Omaha (UNO), but also the entire state of Nebraska. In May, Ellen Freeman-Wakefield, UNO’s School of Public Administration professional programs director, was named “Institute Director of the Year” by the International Institute of Municipal Clerks (IIMC). The honor, which was presented at the organization’s annual conference in Norfolk, Virginia, is the highest possible given by the IIMC, which represents thousands of cities and towns ranging in size from 250 people to more than 10 million people across North America and 15 other countries across the world. Freeman-Wakefield has served as director of professional programs for the School of Public Administration since 2010. 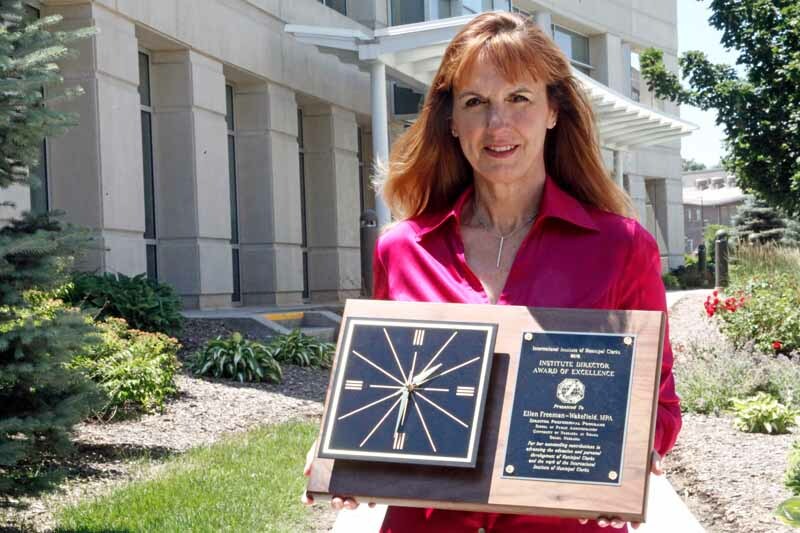 Known for her professionalism, knowledge of public and nonprofit organizations, and work with numerous local and state-level boards, she was viewed as a logical fit for the award by the IIMC. Her role requires her to wear many hats, including leading the charge for the statewide Nebraska Municipal Clerks Institute and Academy. Each year, municipal clerks representing hundreds of local governments across the state regularly meet to attend continuing education professional seminars. In addition to her role with the Nebraska Municipal Clerks Institute and Academy, Freeman-Wakefield also serves as the director of the nationally-accredited Nebraska Certified Public Manager® (CPM) Program, a management development program for aspiring managers in local, state, federal and nonprofit organizations. She also continues to expand the reach of professional programs beyond the walls of campus with initiatives focused on emerging nonprofit leadership through a certificate offering as well as teaches for both the undergrad and graduate programs within the School of Public Administration. In the words of one of her nominators, RaNae Edwards, city clerk for Grand Island: “The Nebraska Clerks are truly indebted to Ellen for her leadership, organization and guidance she brings to the Institute, Academy, meetings and events. We are extremely proud to have Ellen Freeman-Wakefield as our Institute Director and we believe she is a tremendous asset to the organization and Municipal Clerks from around the world. There is no one more deserving of this award of excellence than Ellen Freeman-Wakefield,” RaNae Edwards, Grand Island City Clerk. From her contributions in the classroom to her international reach, Freeman-Wakefield is making innumerable impressions on each and every individual she meets. She is an irreplaceable member of the School of Public Administration, a tremendous asset to the University of Nebraska at Omaha, and a lifelong advocate for public service and education.